Fertilizing Japanese maples, how and when should it be done? You have to ask yourself why you have the compulsion to fertilize your Japanese maple. Is the tree looking sickly? Would you like it to grow more quickly? Or are you just trying to give it the best care that you can? Japanese maples are truly one of most low maintenance plants you can have in your landscape. They don’t ask for or require much of your attention. So with that said, sometimes it’s better to leave well enough alone. Is fertilizing a Japanese maple a good thing or a bad thing? In many cases fertilizing these low maintenance plants can do more harm than good, unless you really understand how and why fertilizers work. Most commercial fertilizers contain three primary components; nitrogen, phosphorous and potassium. Lawn fertilizers are very high in nitrogen and low in phosphorous and potassium. Lawn grasses are vigorous growers and need pruning (mowing) every few days. Therefore they use, and can tolerate, a much higher amount of nitrogen than most other plants in the landscape. It’s the nitrogen in the fertilizer that stimulates vegetative growth. A typical analysis of a lawn fertilizer would be 18-5-5 meaning that the fertilizer contains 18% nitrogen, 5% phosphorous and 5% potassium. That’s a really high amount of nitrogen and should only be used on lawns. Phosphorous helps plants to produce a better crop of flowers or fruit, but what phosphorous really does is help the plant process all of the nutrients in the soil. A plant that is lacking in phosphorous will look sickly and be stunted because the process of photosynthesis will not be working correctly. However, in my forty years as a gardener I’ve never had to deliberately make an adjustment to the amount of phosphorous available to any of my plants. So be careful not to read too much into this rather technical explanation of fertilizer components. Phosphorous also helps to establish strong root systems. Potassium also helps plants utilize the other nutrients they need for vigor. Potassium actually gives plants stamina and helps them to produce better fruit. Potassium more or less regulates how much of each nutrient the plant is able or allowed to absorb at any given time. A typical garden fertilizer might have an analysis of 14-14-14 which is equal parts of nitrogen, phosphorous and potassium. But what’s really important to understand is these types of fertilizer are very quick release. Which means that as soon as you apply the fertilizer and it gets watered in, it will release 100% of it’s chemical components immediately, all at one time. Garden fertilizers are usually applied in the spring before the garden is planted and they are worked into the top three to five inches of the soil. This type of application helps to increase the nutrient levels in the soil. Since no garden plants are present at the time of the application, there is no chance of damaging plants with too much fertilizer. By the time the plants are in place the levels of nitrogen and other nutrients in the soil have leveled off to a safe level. So with all of that said, let’s think about Japanese maples and why we should or should not fertilize them. First of all, it really doesn’t take much to make or keep a Japanese maple happy. Here’s what they like. They like good, rich topsoil that is high in organic matter and drains well. They like sunshine, but often appreciate a little shade to give them a break from the sun for at least part of the day. Here’s what they don’t like. They don’t like heavy, wet soil that does not drain well. They don’t like wet feet. The soil they are planted in should be moist, not wet. When it rains or they are watered, the excess water should drain away quickly. They do not like, nor can they handle large amounts or sudden bursts of nitrogen. A Japanese maple is a very slow growing plant which is why they cannot process large amounts of nitrogen. I don’t know, maybe I’m a little wacko but I think about things like corn versus Japanese maples. These are the kind of things that amaze me as a gardener. You can plant a kernel of corn in the spring and by the fourth of July you have a plant that is knee high, by mid August the plant is five or six feet tall and loaded with edible ears of corn. A plant like that needs and can use large amounts of nitrogen, phosphorus and potassium. A Japanese maple on the other hand can take up to two years just to germinate from a seed and might only grow a few inches in it’s first growing season. Just something to think about. So . . . should you fertilize your Japanese maples? If your tree is planted in really good soil that drains well then there really is probably no good reason to fertilize them. I never fertilize any plants in my landscape except my roses. And the only reason they get fertilized is because I treat them with a three in one product to keep the bugs and disease away, and it contains some fertilizer. If you mulch them, use an organic mulch like hardwood bark mulch that eventually breaks down into really valuable organic matter. Now, with all of that said, if you want to fertilize your Japanese maple this is how you do so. First, consider a fertilizer that is 100% organic. Milorganite, or some type of fish emulsion fertilizer. Milorganite can be difficult to find and should not be used on a vegetable garden because it is made from granulated sewage sludge, but it really does work and it’s safe for non food types of plants. Or you can use a slow release fertilizer like Osmocote. And this is where it gets confusing so I’ll explain it this way. A typical garden fertilizer will have an analysis of 14-14-14 and once applied it takes just days for all of those components to release into the soil. Osmocote will also have an analysis of 14-14-14 but the fertilizer pellets are coated in such a way that it takes three to four months for the fertilizer to completely release. So you can think of it as a slow, safe drip of fertilizer applied to your plants. In the nursery industry slow release fertilizers such as this are the only thing we use on our plants. Especially those growing in containers. Make sure you understand the difference. They are both 14-14-14 but one is safe for Japanese maples, the other one will kill them. I can’t be any more blunt than that. I moved into this home where there is very hard soil. Needless to say the Japanese maple looks awful. Cani try to loosen soil around roots and add new top soil? If that means doing root damage to the tree wait until the tree is completely dormant. Be careful not to create a situation where water can run in by the roots and not get out. I live in California with very heavy clay. One way to get around the issue is to use an acid planting mix with the soil and mound the plant up partially above ground level to promote drainage. If left in a new ground level hole then it will often not drain well. Do all transplants when dormant. I’m keeping my first Japanese maple on my porch. It is rather hot and windy so I put it in a corner to protect it. Some of the leaves started to die, it has white raised bumps (They are looking better than they used to) about 10 leaves are starting to brown. Any tips? Japanese maples are pretty simple and when they have problems it’s either too wet, too dry or too much or not enough fertilizer. Maybe too much wind or too hot. Really hard to say without knowing a lot more. release fertilizer Osmocote or just leave it alone. We have had record temperatures here, in the 90’s. How often should I water the tree? Just leave it alone, keep it watered once a week when it’s hot out. Give it a chance to fix itself. manure mixed well into the planting site and a little bone meal added to the maple hole? Thanks for the info and support you give. Mike in Seattle. Live north of Houston, in Willis, Texas. Planted Japanese maple in well drained soil in early spring, but seems summer heat/humidity takes a toll on tree. It began dropping leaves until a sunshade was placed over it. Now seems stable but unsure if desirable to fertilize or whether it will survive in this climate. Any suggestions? I have gone through the website and think I did it just at the right time,my tree had started to throw leaves and panic set in. It is in a plastic pot and has been since I got it six or seven years ago, my wife and I bought it for my first granddaughters birth. I then made the mistake of feeding the tree as it was starting to throw leaves after two months the leaf tips started to brown and I couldn’t understand why, luckily I was able to remove the feed I had put on the tree so I am hoping that this will stop anymore leaves going brown. Fingers crossed. THANKS. Great site. Hello Mike, I use to my seedlings 3 parts of bark an 1 of compost. Is it take a excess of organic matter? It would be a problem to my japanese maples? My seedling just dry leaves, it just happens, and I do not why it happens. Thank you. Your site is awesome. As long as your medium is draining, drying out between waterings it should be fine. You can always add some perlite to the mix to lighten it up and make it breath better. My 15 year old Japanese Maple in Northern CA had a broken water main below it. The plumbers had to cut roots to get to the pipe below the tree. The hole is filled back up with soil now and the pipe repaired. This took place at the end of November when the tree was probably dormant. Should I do something to help it along? It won’t warm up now until around March. No, the most important thing is that the hole is completely filled so there are no air pockets. Don’t fertilize it or anything like that, it should be fine. Give it all the time it needs to recover, it should be fine. I am from sunny Melbourne Located in Victoria Australia. I have a worm farm producing liquid fertilizer and some inch high Japanese maples seedlings growing. Are these two a good mix along with the slow release Osmocote? or should I just stick with water? Some worm tea is fine, but keep in mind that Japanese maples grow slow and cannot use a lot of fertilizer. That’s why I like the Osmocote because the release of nitrogen is controlled. this is really helpful. i’m in Northern California, and have really heavy clay soil. i’m translplanting 3 JM’s because i put them in the wrong place initially, and the sun burned the leaves. i understand your guidelines for not amending the clay soil, but i’m concerned that they won’t be able to root into the soil if it’s clay. i’ve had some holes dug that are very deep and wide, for about a 12-18 in root ball. this now seems excessive. my questions: really REALLY no amendments to the clay soil it’s going into? what kind of topsoil do you recommend, that you mention needs to be mounded for drainage? should i prune them a bit just before i transplant them? wish me luck! thanks in advance for your advice. Definitely transplant them while they are dormant. More importantly than anything in your situation, plant them high, with the crown of the root ball at least 6″ above grade. Use the clay to fill the bottom half of the hole so water cannot stand in there forever. Then you can ammend the clay with topsoil that you use to back fill around the raised root ball. Most importantly, when it rains the water has to run away from the roots of your trees and never stand around the roots or the soil remain soggy. Roots need to be able to transfer oxygen through the soil to the roots. Standing water prevents that from happening. I don’t think you need to prune them. Plants make a root inducing chemical called Auxin, think I spelled that correctly, at the tips of the branches. I’ve transplanted very large, well established Japanese maples with zero pruning and have had great success. Most general garden fertilizers are fast, or immediate release. A quick release garden fertilizer will for sure kill Japanese maple and most other ornamental plants. We usually specially formulated slow release fertilizer that take anywhere from three months to nine months to fully release. A slow release that you can buy at most big box stores is Osmocote, but be sure to make sure it says slow or timed release for a period of 3 to 4 months. Typical 14-14-14 garden fertilizer sells for $10 or $12 a bag. We buy a 14-14-14 slow release and pay $60 to $90 a bag. That’s the difference. I have a Japanese Red Maple that is located on property that I rent to tenants. Tenants want it moved because of mowing grass. This spring it now is infested with inch worms. Tree is located in Raleigh, NC and temperatures have been varied between freezing and 70’s. Can I properly move the tree and plant it in a container to grow. I will be taking it to Chesapeake Bay area in Virginia where it is 8 degrees cooler. My mother planted it and she has passed away and want to keep it. Thanks in advance. I have 3 Maples. One is low to the ground with a wide circumstance and is beautiful. I have 2 more that grow higher and bigger but look awful. They were beautiful until the last couple years. Now they aren’t near as full as they used to be. I’m afraid they are dying. They are approx. 12-13 years old. What can I do to bring them back to health. I’m guessing that your trees suffered some winter damage. Not much you can do except prune out any dead branches and trim enough to balance the trees. They might come back spectacularly, I’ve seen it happen, but it can be a multi year process. I planted my sango kaku in my back yard last summer, and it seems to be doing fine. It was in a planter for a few years before that and didn’t grown much. The only problem is that the trunk is only 1 inch thick and the branches are even thinner. Should I fertilize it so that it will grow? If you do, use something organic. Regular garden fertilizer will kill it. But I’d never fertilize the plants in my landscape. Never have, they just don’t need it. I have a 30 year old Japanese Red Maple that I just discovered has bores. I had a tree expert tell me it is a weak tree (I am constantly picking up dead branches) and it is dying and I should fertilize it. The leaves are a little sparse at the top and I pruned a couple dozen dead branches from it and am looking for the 10 4 6 fertilizer he said to use but I can’t find it. Do I need to fertilize it and what about fertilizing the lawn around it? Do I hold off on the lawn if I fertilize the tree? What do I do about the bores? I am near a marsh and have a clay base. I want to purchase a Japanese Maple from Home Depot or Armstrong but I want to plant it in a huge pot I have. I hear they can grow well in pots, just don’t over water them as they don’t like wet feet. I won’t fertilize it or will use Osmocote now and then but sparingly. I will aerate the soil with Vermiculite etc. Any other suggestions other than part sun part shade? It sounds like you have it figured out, but you don’t say where you live. But it should work fine for you. Hi, we have a Japanese Maple that has leafed out on one branch this year and has two small buds on the trunk, the rest of the tree there is nothing. I tested the soul. It tests low for nitrogen, however I believe the problem is that the tree is sitting in water and not drain. Can it be moved now or do we have to wait until fall? Or can it stay there and suggestions on fixing the drainage issue? It’s in a bed at the end of s sloped yard and has a drip water system near it. It needs moved, but that could kill it if it’s been planted for very long. Fixing drainage is not an easy thing to do. Would require french drains or grading. Hello Michael, thanks for the article. I have a weeping Japanese Maple, about 30 plus years old. Every year, in the pass 4-5 years it dies back some. There is ground cover underneath and it is right next to a very large spruce tree, but does get enough sun. Thought it might be competing for water – perhaps the problem. But an arborist suggested fertilizing it. I am thinking if I use the Osmocote it might help, but shouldn’t hurt. Any thoughts? Thank you! A bit of Osmocote won’t hurt it, but I never fertilize any of the plants in my landscape. We are still seeing winter damage from those two really hard winters, that could be part of the problem. Corrected email for previous post. Thank you. Hi Mike, I really need your advice. This year our 40+ year old Japanese Lace Leaf Maple tree hardly has much leaves on the top and has sparsely spaced leaves just about 2 1/2 feet from the bottom edges, probably as a result of a bad winter snow (2 + feet for a couple of weeks). We keep our tree pruned so the leaves do not touch the ground; it is about 2 1/2 feet off the ground. Some years I may feed it Osmocote, but this year it looked sickly and may have been fed a little bit of Miracle grow food in early Spring. It still has leaves! Can I revive it by feeding it Osmocote now (July or August 2016)? Thanks in advance for your help. The truth is a 40 year old Japanese maple shouldn’t need any supplemental fertilizer. It sounds to me like the tree is in trouble, something is going on with it. Two feet of now really shouldn’t do any harm at all, actually should help insulate the roots of the tree. I don’t think osmocote is going to change anything. When a mature plant is in trouble I like to just prune as needed and give the plant a chance to heel itself. I have my Japanese Maple planted in the front yard surrounded by lawn. It is early spring in Australia and I have just done an over sow and was going to fertilise the lawn with charlie carp. Should I avoid getting close to the tree or avoid doing it at all? I would make a reasonable attempt to stay back from the tree but even if you do get close I’m sure it will be fine. Hi Mike, I live in Southern California and have a 27 year old Maple in a pot. I have heard that blood meal and kelp meal are good for it, your opinion on that? Plus, when do you add supplements? Also, what about aged steer manure, if it can be applied , when should you do it. Thanks. I’m sure the blood meal, kelp meal and aged steer manure are all good things but I wouldn’t do them all at once. Add one at a time during the growing season. Additional fertilizer can be tricky. I would use only Osmcote slow release applied once per season. Probably just two tablespoons in a larger pot. Hi Mike. I live in Philadelphia Pa and planted a 3 mos JM last summer. It had very good leaf coverage the rest of the summer and fall. I am new to JMs and wanted to know if there was anything I needed to do to it? The trunk is about 4″ in diameter and we have gotten new branches since planting but no new height (it’s about 2ft tall). I have received all kinds of advice from doing a “1 yo fertilizing” to “pruning branches to shape it”. What should I do? A little shaping as needed is all you really need to do. I never fertilize mine in my landscape and they are beautiful. Is there a way to shape or do I just cut off he small branches that I don’t want? And thanks for getting back to me so quickly! I just bought a bloodgood Japanese maple. It is @ 12 ft tall and has a thick sturdy trunk. I plan on planting it In a 8′ x 2’x2′ galvanized storage tank/ trough. All the potting mixes or potting soils have fertilizer in them. One had .10 nutrition and the other bag had .30 total nitrogen. Is that okay for potting soil? Can you give me a good recipe of soil, compost,ect for my huge galvanized tank. The root ball is about 10″ wide by 12″ deep. Is it okay to plant in such a large container now the tree is this size? Most importantly, this big glavanized tank needs to drain well. If it holds water that will kill the tree. The fertilizer in the potting soil probably won’t hurt anything, but most bagged potting soils don’t drain well enough to be outside picking up heavy rain. I have a 25 to 30 year old Japanese maple tree> it produces seedlings every year . I have transplanted several of these . I have around 10 seedlings that I am going to transplant into the ground or would containers be better ,Should I mix peat moss along with garden soil or potting mix ? I also have purchased 16-4-8 fertilizer is that a good type and how much if it is needed should I apply to the soil? The trees would be happier and easier to care for planted in a garden. Just good garden soil is all they need. The 16-4-8 fertilizer could easily kill them, I would not apply it at all. We fertilize plants in pots with Osmocote but it is very slow release, taking months to fully release. Other fertilizers release completely with the first watering. Unfortunately I applied 10-10-10 to my Japanese Maple and it is not doing well at all. It has some buds and leaves, but nothing like it should. Is it a lost cause or is there a chance it could make a comeback.? Not a lot you can do but wait and see what happens. I really wish I could get this message out more. I think I’ll make more of an effort. I’m in Euless Texas (Between Dallas and Fort Worth), just purchased 2 young japanese maples one is a Bloodgood and the other is a maple red select(lace leaves) so glad I read your column and learned not to feed them bloodmeal like I do with gardenias and red prince widgelias . I have planted them in a “large” planter and I’m keeping them in a partly sun/shade area. I will not fertilize them until next year unless you suggest me to do so… with some osmocote. Please let me know if I should bring them in during winter when it gets really cold 17F. or if I should just let them adjust, Thank you so much for your help. They should be fine outside, all of my stay outside and I’m in Ohio. Many of them in pots. I have a Sango Kaku that needs serious help. I bought it from a nursery who said it’s about 10 years old. After planting in my yard for about a month it did beautifully. The leaves and branches just flourishes. Then there was a couple of weeks after that beautiful period…the leaves all turned down. I thought it needed fertilizer. I asked the gardener to put some Amend (potting soul) in. I am not sure what/how much he put in but since then ALL the edges of the leaves have started to brown with part of the tree being worse than others. Some part of the tree have very light yellow leaves with lots of brown edging and some of the tree has green leave with those leaves starting to get brown edges as well. I have been told several thing by so many people I am not sure how to proceed. After reading your site….it sounds like my tree is over fertilized. Is that correct? If so how can I save the tree? I am in love with this tree. My 4 year son and dad planted it on a very special day. PLEASE HELP!!! Thank you in advance for taking the time to address and sharing your expertise. Could be too much fertilizer, could be too wet, could be planted too deep. If you just planted it a month or ago I’d get it out of the hole, dig a new hole and just plant the tree. Do not over dig the hole, do not amend the soil with anything. Plant the tree with the top of the root ball about an inch or 1.5″ above grade, cover the root ball with soil and 2″ of mulch. No fertilizer, no other amendments at all. Water about twice a week. Hello Mike, I live in Southern Calif. and we bought a potted Japanese Maple “Bloodgood” about two years ago. It is 5 feet tall and the trucks is about 2.5 in. around at the bottom. I would like to move it from it’s present 17″x 17″ pot to a pot that is 20″ in diameter and 20 in.” deep, they both have excellent drainage and I water about 2 times a week. I have fertilized just twice since we’ve had it. 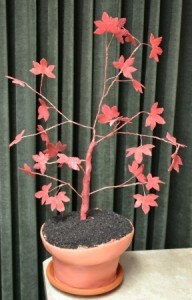 I used a “Japanese Maple” fertilizer 4-8-5 called Happy Frog, made here in Calif. The analysis is 4% Nitro, Available Phosphate 8% and Soluble Potash 5%, contains feather meal, bone meal. fish meal, fish bone meal, alfalfa meal, sulfate of potash magnesia, bat guano and gypsum. 4% slow release Nitrogen from feather and fish meal. I have tried to pretty much follow what you have suggested in the care of this beauty, when I prune, which could be at any time the hand clipper blade is cleaned with alcohol .Right now the new leaves are coming out Red and then turning Green, also some of the tips are acting like they are burnt. Have I messed up? Thanks for all the great information, I appreciate it very much. Love my tree. The green leaves usually means the tree is not getting enough if in fact it is a bloodgood. The fertilizer you mention is find when used in moderation. Plants in containers do need some fertilizer, but it’s safer to use something that releases slowly over time so you can’t make a mistake. Osmocote 14-14-14 is fairly easy to find and releases over 3 to 4 months. The brown tips could be it dried out a bit or just from the sun. I wouldn’t be overly concerned but I would not fertilize it for a while but do keep it watered. That container size is going to be too small for that tree in time, really might be too small now. The house we bought last year has a big beautiful Japanese Maple. I’m guessing it’s about 20 years old. The previous owners told us to fertilize (non organic – so we did early Spring ’17) and now I’m noticing it’s not nearly as full as last year – it has a good number of bare branches and it’s producing seedlings. How worried should we be that the fertilizer damaged the tree. Anything we can do to “help” the tree at this point? At this point the tree is alive, any damage that was done is done and the tree will likely now start recovering. Hi, I have a very beautiful Japanese Maple Emperor. I have basically in bonsai, but it is a bigger one, about 3 feet, from bottom of pot to top. I live in Eastern Iowa, last year, we had a very good warm summer, and I also breed pleco fish in a 75 gal tank, and that is the only fish in there, they are always eating, either the algea, or supplement greens. All of my trees love this tank water. Back to my tree, last year at the end of the season, it fell in a storm, and it lost all of its limbs. This was in Nov, still very warm, and it started to regrow back when the frost hit, I put it in the garage. Now I have it out in the sun, and its not doing anything, I know the roots are still alive. What do you recommend I do? I think you need to do nothing. Over winter it probably would have been happier outside, unless you always bring it in. But right now, you just have to give it a chance to see if it’s alive or not. I have a Japanes Maple that is about 12-14′ tall. 3 winters ago, we had a couple of weeks in the late winter with unusually high temperatures that caused it to bud early and then it became extremly cold again. When the weather finally changed, I noticed that much of the tree had no buds sprouting leaves. Later in the year, many of these areas came back and filled in. Last year, this weather pattern reapeated but the areas that were frost bitten never recovered and now, about 30% or more of the branches appear to be dead. Is there anything I can do to help it repair itself? Should I prune away the dead branches ? About all you can do is prune away the dead. Just make sure it’s dead before you cut it. This is how you test to see if a plant, or a branch on a plant has died. Just scratch the bark of your plants with your finger nail. If the tissue below the bark is green and firm your plants are fine. If the tissue is brown and mushy that part of the plant is dead. I have a friend who lives in a private seniors community, with a H.O.A. She has an older, well established dwarf Japanese Maple (abt. 5 ft tall) in her front flower bed (bed is mulched, provided by the HOA once a yr, and is completely flat, approx. 20 ft. by 20 ft., with a sprinkler system, had 3 ft tall boxwood bushes along one side of the bed, touching the leaves of the JM, which I removed today at her request – they were dying for some reason, and she has some small seasonal perennials throughout the bed). The 4 sides of this flower bed is her brick house on one side, brick garage on another, then an “L” shape sidewalk on the 2 other sides; there is a downspout at one corner, but is directs the rain water onto the sidewalk, aimed to go across the sidewalk, to the yard. With that said, drainage is not great, the tree is not full – a lot of big open bare spots, with dead limbs. She LOVES the tree, and has asked me to try to bring it back to good health. I turned off her sprinkler system – we just had 5 days of constant rain and the bed is VERY wet. I tested the PH level; it was 5.0. Like I said, I removed the bushes because they were turning brown and looked to have some form of fungus on the branches; prob. due to being in a wet bed. As I moved the mulch around and dug up some plants, near the J.M., I noticed I found several grubs. Do you have any suggestions on how to bring my elderly friend’s Japanese Maple back to good health, with a full canape of beautiful red leaves. Just need some help with a sapling – we live in the northeast and accidentally left it out over the winter in a pot ????. So far it’s not showing any signs of life. Do you think it survived? How long should we wait? Can we do anything to help- like fertilize? Probably a gonner. This is how you test to see if a plant, or a branch on a plant has died. Just scratch the bark of your plants with your finger nail. If the tissue below the bark is green and firm your plants are fine. If the tissue is brown and mushy that part of the plant is dead. A testimony to the staying power of Japanese Maples. Two years ago I had an oak tree removed and instructed the tree surgeons that whatever they did to NOT damage the 10 year old JM I had near the tree. Sure enough a branch fell and spite the maple in two! They offered to “replace” the maple with a new tree from local nursery at 1/5 the size of the damaged tree. I took the damage out in having $500 of additional tree work done fully expecting that the tree would be dead int following year. Now — two years later… the tree has side growth and looks actually very interesting like a combed over canopy bonsai style! Living proof that if you leave these trees alone they can be VERY resilient if there root system is well established! We just moved into a house with a Japanese Maple (about 8ft tall) and an ornamental Japanese maple (about 4 feet tall). The small one didn’t bloom this spring and when I went to cut it back, it was dead. Now, our larger maple has branches with no leaves and the leaves are turning from a light red to an orange and I’m worried it’s dying too. We removed the mulch which we found had created a water barrier. We laid new mulch but just a very thin amount and I kept it away from the base of the tree. Any other suggestions? I love the tree and don’t want it to die like the small one! Typically Japanese maples fail because they are too wet, too dry, planted in an area that receives too much water, or they are planted too deep. In my experience one of those things contribute to their demise. We have had a very hot and dry summer here in southeastern Pa. My Japanese maple started to have entire branches where the leaves died and curled up. I looked it up and wasnt too concerned because it seemed like scorch. However, now almost the entire tree has dead leaves. Is my tree dying? Is there anything I can do to help? It is about 10 to 12 yrs old. I’d say it’s too dry, just water and hope for the best. Just trim lightly if it needs it and give it time. As long as it’s not too wet or too dry it should recover. Hi Mike, I am in Cincinnati and we have a little Bloodgood JM that was doing really well the first two years in our home (the tree is probably 7+ years old). Now it has hardly any leaves and looks just pitiful, and I suspect that our obnoxious chipmunk population has damaged the roots with all of their digging. That is the only difference I can tell that could be affecting the tree. Aside from exterminating those pests is there anything we can do to help protect the tree? I suspect that maybe the tree dried out this summer, I’m not sure that chipmunks would actually eat the roots, but I could be wrong. Not much you can do, mulch and give the tree a chance and it should recover nicely. Wow! You are so great at answering everyone’s questions year after year. I live in Victoria BC Canada and have a mature 20′ red JM that I’ve been caretaker of for the past 4 years since moving here. Every April into May, Winter Moth caterpillars have at ‘er eating into the newly emergent leaves. I painstakingly remove as many as I can from the lower reaches. Two years ago I banded the trees in my back yard with tanglefoot in November and I sprayed with BTK the 1st week of April. Last year I didn’t band and was late on the spray. The caterpillars completely defoliated not just the JM but my two mature apple trees, plus seriously ate holes into the Garry oaks, Japanese plums and even some rhododendrons. My heart sank seeing the JM and apple leaf-less after such a beautiful, bountiful spring flush. Miraculously the apples regrew a luxuriant foliage cover after a month (but not a single apple, despite having been covered in blossoms). The Japanese Maple grew much smaller leaves and the density of foliage is probably just 20% or 25% of what it’s been in previous years. Needless to say I’ve just banded as many of the trees with tanglefoot as I could and will be out there with BTK at bud break next spring. I mulched some of our oak leaves and put them at the base of the JM. Given the shortage of leaves it had all summer, should I be thinking of any additional natural additives to the soil at this time? I honestly I’m not sure, but check out this website, https://www.gardensalive.com/, they might have something that will help. Unfortunately Winter Moths don’t come up in the Gardens Alive search engine. In any event, I think I know the only known somewhat reliable controls available. My question was more about what to do for the JM given the fact that its foliage was so depleted this year. When a tree has fewer leaves I imagine that means less photosynthesis? I will hope that the actions I’m doing now (banding with Tanglefoot) and spraying with BTK (Bacillus thuringiensis) in April will result in better spring conditions for the tree, but again, just curious about fertilization to compensate for the much fewer leaves in had this year. I live in coastal AL. My soil is very Sandy but I have amended the soil when planting my Japanese maples. My biggest problem is Browning on the edges of the leaves and thar would be those in sun and shade. I also have on tree that has very small leaves and leaf drop during growing season. I have been using well rotted rabbit manure as fertilizer. The year before that I used a slow release grass fertilizer. The organic soil amending is great, your trees probably don’t need any additional fertilizer. Browning on the edges of the leaves is normal, even here in Ohio. Not something I’d be concerned about. It’s just the summer sun and wind on delicate leaves. Water when really hot and dry but only the roots. Don’t wet the leaves. Mike great blog! Ok so I had to transplant an established Japanese Maple, it was there about 15 years, but needed to move to back of house to put in a parking spot. Roots were huge and had to cut some, last year it only about 1/3 had leaves on it, I am worried about loosing the whole tree, I have not given it anything, What should I do this winter to pray it lives and more of it has leaves this year, I am in NJ. If it had leaves last summer, even a smaller amount of leaves, I would expect it to bounce back. Should look better this year and even better next year. I really wouldn’t do anything at all, just give it time. No fertilizer to help it at all? You really don’t want to push a tree that is unable to use the nitrogen that you apply. Maybe a few fertilizer spikes once the tree looks to be on the road to recovery.